One of the nice things about living in our part of southern California is that the minute winter turns to spring, strawberry stands pop up on what seems like every corner where there is a vacant lot. These strawberries are huge. They are the kind you might imagine they use to make chocolate dipped strawberries. We usually have at least three or four baskets of strawberries in our house at all times. Thus these scones. They are made with vanilla, cream, and butter, and brushed with a vanilla glaze. I also added a couple of drops of Fiori di Sicilia, which is a concentrated blend of vanilla and citrus. You could also add a few scrapes of orange zest if you'd prefer. I made mine in a Mini-Scone Pan, but that is not necessary. You can also make them free form and cut them to size and separate them on a baking sheet with a bench scraper prior to baking. 2.5 ounces of diced fresh strawberries. 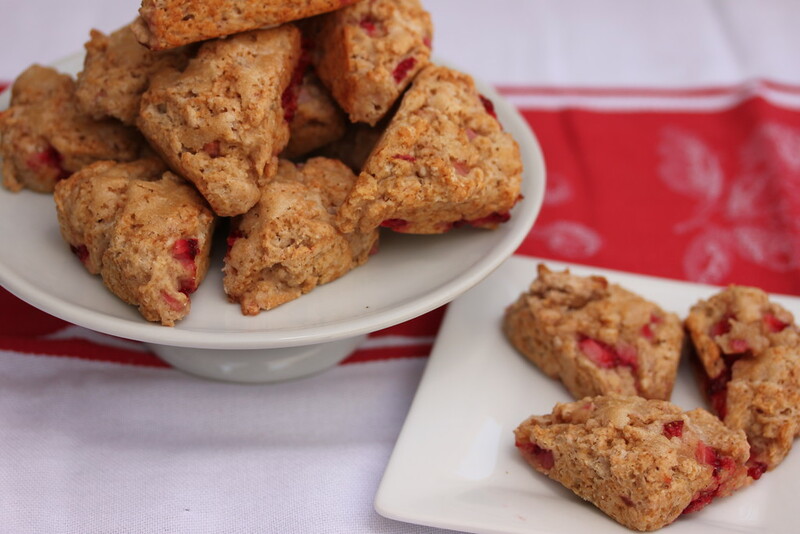 Grease a scones pan or line a baking sheet with parchment paper. In a food processor or blender, mix 2.5 ounces of strawberries, 1/4 C of sugar, and 2 T of half and half. Whisk the flour, salt, and baking powder together in a large bowl. Add the butter and cut it into the flour mixture with a pastry cutter, fork, or your hands until crumbly. Mix the strawberries and cream, egg, vanilla, and optional Fiori in a small/medium bowl. Add the liquid to the flour mixture and stir just until the dough comes together. Add the rest of the strawberries and stir until they are evenly distributed. Do not over mix. Either evenly distribute the dough into the greased scones pan, or pat the dough onto the parchment lined baking sheet. If you are using a baking sheet, cut the dough into triangles with a bench scraper and gently separate the pieces. Prepare the glaze by stirring the ingredients together and brush it over the scones. Bake for 15 or 16 minutes, until just golden. Thanks Lora. This series really got me started in blogging. I really appreciate your putting this together. Absolutely gorgeous Karen! And a scone pan? Now, that´s one pan I´m missing...! Well... I'm kind of a kitchen gadget addict (she says as the UPS truck drives up with another new toy). I used to live in CA so I totally know what you mean about the minute winter turns to spring, and there are strawberry stands everywhere! Awesome! Lovely lovely scones! Delicious! 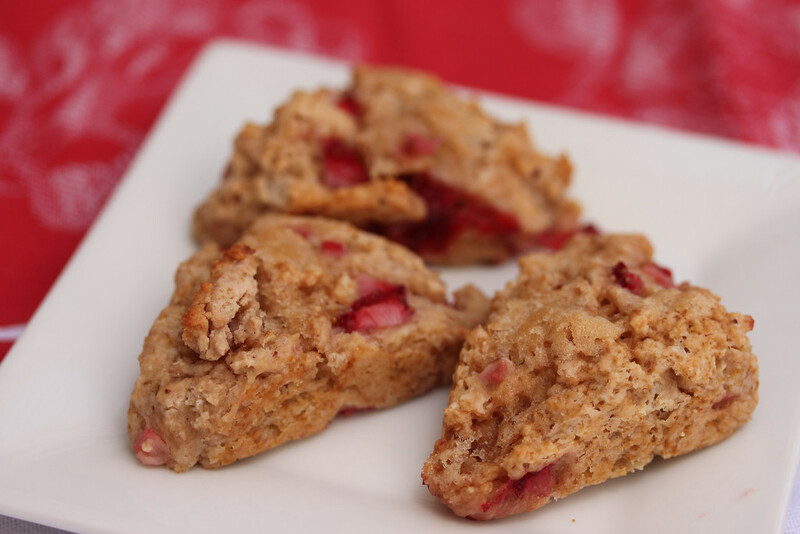 Oh, I must bake up some strawberry scones! I have a bottle of Fiori di Sicilia that I've only opened to smell...I'm glad I have a new recipe to test it out :) Thank you!!! Thanks Liz. I'm addicted to all things King Arthur Flour. Definitely give it a try. A little bit goes a long way. It's great in Panettone too. 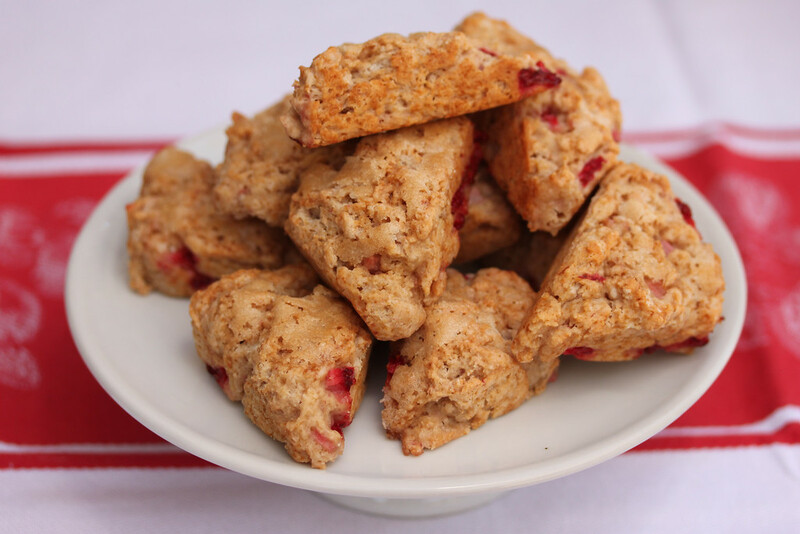 I especially love scones as a weekend breakfast treat. As soon as fresh strawberries from the local farms are available here I must make these. They would be fabulous with a big mug of coffee. What a great way to start the day. Wow. Fiori di Sicilia and strawberries: what a great mix.